I am a member of the astronomy faculty at the Research School of Astronomy and Astrophysics (RSAA) at the Australian National University (ANU). 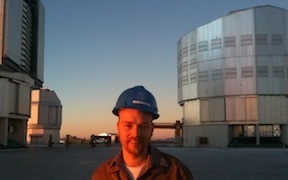 This means that I get to spend the majority of my time doing what I love: using novel instrumentation and techniques, including the world’s largest telescopes and optical interferometers, to search for planets around other stars, and to study the life cycle of stars. I lead an active research group who meet regularly as part of the FEARS and planets lunches on Tuesdays, and the GASP (Galactic Archaeology, Stars and Planets) meetings on Wednesdays. I was a senior lecturer in astrophotonics in the Department of Physics and Astronomy at Macquarie University from 2011 to Jan 2014, and had a joint position in the instrument science group at the Australian Astronomical Observatory (AAO). I still maintain strong links to both these groups, and am the co-Project Scientist on the Gemini High-Resolution Optical Spectrograph, led by AAO. Prior to my time at MQ/AAO, I was an ARC Postdoctoral Fellow at the University of Sydney. I still maintain strong links to that department also, including collaborations related to the PAVO instrument I built for the CHARA array, and on mid-infrared photonics for future exoplanet instruments. Please email me if you are interested in a student project! When I am organised enough, I'll put projects on my ANU researchers page. They are currently on the research school project page.